Academically and professionally qualified partner is sought by B/​G retired parents for their 25 years old pretty and slim daughter. She studied at a leading girls’ school in Colombo and is working in a reputed company while persuing her studies. Willing to migrate. Academically professionally qualified with potential overseas career advancements willing to relocate well mannered good looking,​loving,​caring bachelor son of 36-39. Age is sought for our Catholic Salagama daughter born April 1983,​5’1” curvy body with pleasing personality domiciled overseas Senior Manager in Dental Industry. Buddhists Catholics Local Overseas. Replies welcome. English fluency required. Email: n​i​j​a​y​2​0​1​0​@​y​a​h​o​o​.​c​o​m​. Contact Telephone No. Academically qualified pretty fair slim daughter 5’2”,​age 34,​works as Manager in a reputed multinational audit firm in Canada,​seeks professionally qualified partner preferred with sober habits non smoker from a wealthy family. Email to: p​r​o​p​o​2​0​1​9​c​o​l​o​m​b​o​8​4​8​7​@​g​m​a​i​l​.​c​o​m​with horoscope,​full details in first email. A suitable well employed partner is sought by mother for her daughter Sinhala Buddhist Durawa/Govi 44yrs 5’5” an Accountant in a leading company, drawing six figure salary. Owns a house and a new car. Reply with family details and horoscope. 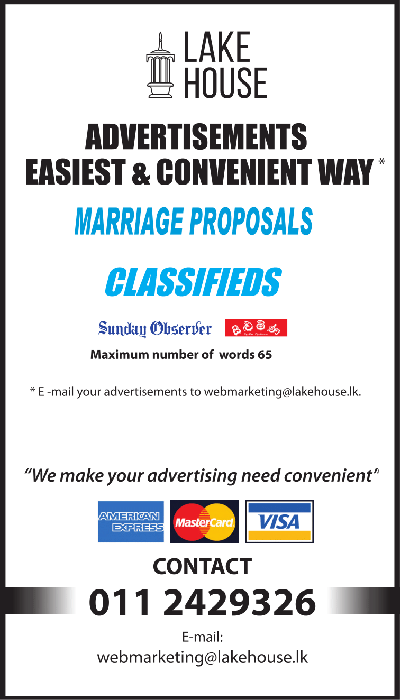 Buddhist G/​K/​D respectable parents from Colombo seek well mannered well established,​professionally qualified son with sober habits for our daughter 27,​5’3’’,​pretty,​well endowed educated in a leading school in Colombo,​degree in IT and HBA qualified currently employed as a Senior Engineer in a reputed company in Colombo with six figure salary. E-mail: d​r​j​p​r​o​p​o​@​g​m​a​i​l​.​c​o​m​Tel: 011-2811866. Buddhist,​Govi parents looking for an educated,​professional and kind son for their pretty,​smart,​well-mannered never married daughter. She obtained PhD from top ranking UK University and working as a Lecturer (Assistant Professor) in the UK University. Born in 1978,​5’8’’,​substantial assets in the UK and SL. Caste,​religion immaterial. UK prefers. E-mail: p​r​o​p​s​o​2​0​1​8​@​g​m​a​i​l​.​c​o​m​055-2276953. Govi Buddhist parents from Colombo are looking for an academically and professionally qualified kind-hearted son as partner for their daughter born in August 1993,​studying for a Finance Degree. She is brought-up with Buddhist Values and owns a newly built modern house and a vehicle. Overseas proposals are not considered. Please reply with family details and horoscope. Govi Buddhist parents seek partner for 47 yrs,​never married young looking slim,​pretty daughter employed/​PR in USA. She will be in Sri Lanka soon. Reply with full details. s​a​t​h​p​r​o​p​o​s​a​l​8​5​@​g​m​a​i​l​.​c​o​m​Tel: 0112849818. Legally separated,​pretty,​innocent,​age 42,​5’1”,​Sinhala,​Buddhist daughter from a respectable family seeks a suitable partner below 48 from Sri Lanka or Australia. She inherits substantial wealth. Looking for suitable partner for 27 years old 65 inch KGB homely girl studied Science at Mahamaya Kandy. Presently studying a British business degree at private campus in Kandy. Fluent in English, will inherit valuable properties including house in Kandy and income generating properties. Software Engineer daughter in Australia 1990/​4,​5’6” S/​B parents seek a handsome son well mannered educated already settled in Australia or willing to migrate. Reply with family details. email: m​a​.​p​r​o​p​o​s​a​l​1​2​3​@​g​m​a​i​l​.​c​o​m​033-2260423 (Kuja 1,​2,​4,​7,​8 preferred). Tamil Catholic parents seek a suitable professionally qualified partner for daughter 40 yrs 5’3” fair slim pretty professionally qualified in IT and holds a Masters in Maths from an University in U.S.A. Presently employed as a quality engineer in a leading computer solutions company in U.S.A. Call 0112419289.